GP African Amethyst (Ovl 8.48 Ct), Kanchanaburi Blue Sapphire Ring in 14K Gold Overlay Sterling Silver 8.500 Ct.
9K Yellow Gold AAA Extremely Rare Cut Zambian Amethyst (Hrt 8.00 Ct), Natural Cambodian Zircon Heart Ring 10.00 Ct.
Lusaka Amethyst (Rnd), Natural White Cambodian Zircon Butterfly Ring in Platinum and Black Overlay Sterling Silver 2.000 Ct, Silver wt 7.43 Gms, Number of Gemstones 109. Rose De France Amethyst (Ovl 5.30 Ct), White Topaz Ring in Rose Gold Overlay Sterling Silver 8.250 Ct.
Rose De France Amethyst (Cush) Ring in Platinum Overlay Sterling Silver 12.750 Ct.
Rose De France Amethyst (Ovl 15.90 Ct), Natural White Cambodian Zircon Ring in Rhodium Plated Sterling Silver 17.640 Ct. Silver wt 5.71 Gms. Rose De France Amethyst (Ovl 7.16 Ct) 5 Stone Ring in Rhodium Plated and Rose Gold Overlay Sterling Silver 14.000 Ct.
Lusaka Amethyst (Ovl 4.25 Ct), White Topaz Ring in Rhodium Plated Sterling Silver 5.700 Ct.
Lusaka Amethyst (Ovl 5.30 Ct) Ring in Platinum Overlay Sterling Silver 6.000 Ct.
One Time Deal-Lusaka Amethyst (Ovl 5.50 Ct), Natural Cambodian Zircon Ring in Platinum Overlay Sterling Silver 6.000 Ct.
Rose De France Amethyst (Ovl 11.25 Ct), Rhodolite Garnet and Russian Diopside Ring in Rhodium and Rose Gold Overlay Sterling Silver 16.000 Ct. Silver wt 6.74 Gms. Rose De France Amethyst (Rnd) Ring in Rhodium and Yellow Gold Overlay Sterling Silver 10.500 Ct.
Rose De France Amethyst (Hrt 16mm), Natural White Cambodian Zircon Ring in Rose Gold Overlay Sterling Silver 13.630 Ct. Silver wt 5.25 Gms. 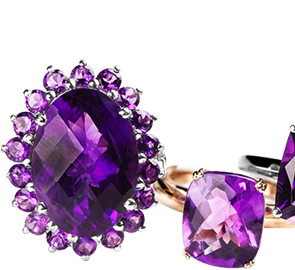 Once regarded as equal in value to ruby, emerald and sapphire, Amethyst – Birthstone of February - is a beautiful gemstone that was an integral part of Egyptians and Greeks’ jewellery in the ancient times. The deep violet hue of this gem has attracted more and more men and women over the centuries and today rings with amethyst are one of the most coveted jewellery items in the UK. And to cater to the rising demand, TJC has put together an extensive array of rings at the most affordable prices. The mystical and deep colour of amethyst pairs up perfectly with the tones of gold. TJC offers a fabulous and wide selection of these rings that flatter onlookers with their radiance and awe. Available in different tones of gold, we have some statement amethyst rings in the traditional radiance of yellow gold, pristine glamour of white gold, and the darling richness of rose gold. Bringing exquisiteness to you in the best of lays, these remarkable delights will steal your heart in an instant. The posh and rich hues of amethyst contrast beautifully with the eternal shine of silver. The two magnetic elements together make for the best ring designs. In fact, our solitaire amethyst rings in silver have been quite the fancy and coveting of countless. We also boast of several other designs that you just cannot miss out on. Our Amethyst heart rings are some of them. We also plate the silver rings to flaunt the sheen of premium metals like gold, platinum, rhodium, and others such. The era of diamond engagement rings is now replaced with coloured gemstones. There are several more options available now, with hundreds of designs that not only suit your tastes, but also complement your style. Our selection of engagement rings with amethyst is something just like that. We offer you a stupendous display of several designs that are curated for forever keeps. Our bestselling amethyst engagement rings in white gold have especially garnered the attention of countless, Come and pick the stunner that will make her the happiest woman on this planet. The bold and deep hues of amethyst look idyllic when they’re paired with the majestic sparkle of diamonds. Our beautiful rings in this category have gained countless admirers. Fashioned in several different designs, like halo rings, trilogy rings, heart rings, and more, these two gems make the best accompaniments for eternally leading fashion choices. Do not forget to explore our array of amethyst and diamond rings in yellow gold, as they’ve been the centre of all attention! One of the biggest reasons is our elite grade and quality. We at TJC believe in mining our own gemstones, which lets us offer only the best class of gem to you. With our real amethyst rings, you’ll never be disappointed or amiss. Another reason for you to come pick us has to do with our pricing. We offer you affordable amethyst rings online, which fit beautifully within your planned budget. Make trends in ways that your pockets will love!